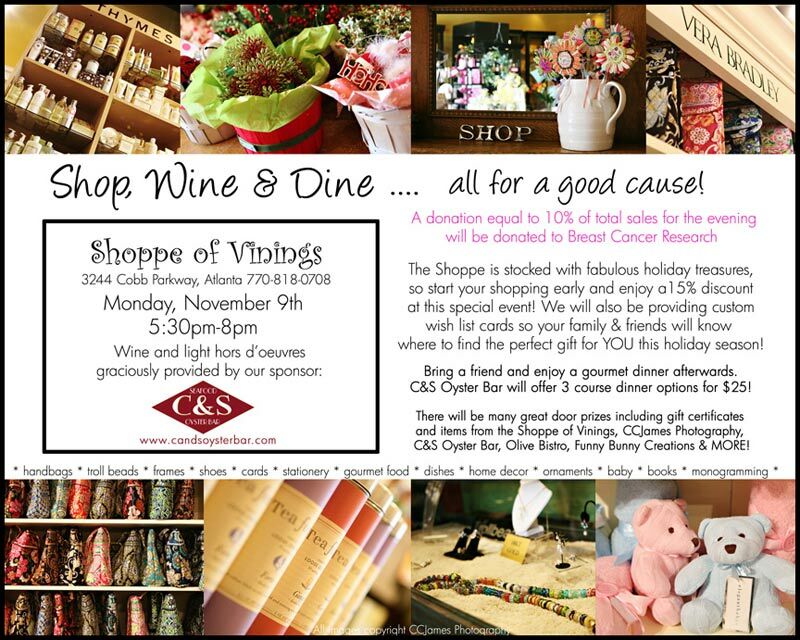 I am very excited to announce a wonderful fall event that I will be hosting with the Shoppe of Vinings and C&S Oyster Bar. For those of you that attended my “Shop, Sip & Savor” event last May which benefited the Crohn’s & Colitis Foundation of America, you already know this is going to be LOADS of fun. But, if you haven’t attended one of our previous events – now is your chance! Grab some friends and come on out for a relaxing night of shopping and dining. The ladies at the Shoppe will help you pick out some wonderful gifts for family and friends – or maybe a Troll Bead bracelet for yourself??? Gift wrapping is complimentary (and oh-so-cute) so bring your list and get the holiday shopping done early! Breast Cancer has touched the lives of so many people, including friends of mine. Almost everyone knows someone with a story. That is why we have chosen to make a donation to Breast Cancer Research equal to 10% of sales from the evening. Every little bit helps – and brings us that much closer to a cure. I hope to see all of your familiar faces at the Shoppe! You can link directly to our EVITE and let us know you are coming.